It is recommended to place the PowerMan below the Formula S, unlike what’s depicted in the photo. I’ve reviewed quite a few headphone amplifiers last year. Including the $7,999 Woo Audio WA33 and the $15,000 Wells Audio Headtrip Reference. 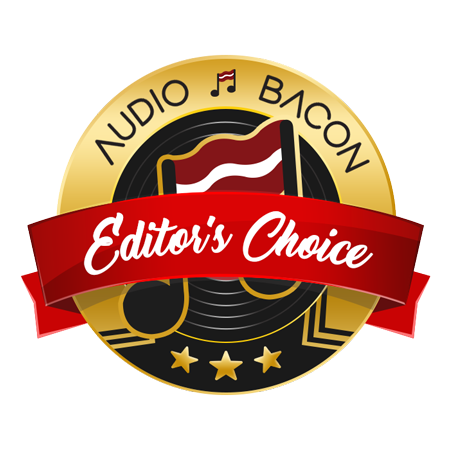 The centerpiece for those reviews was my reference headphone – the Abyss AB-1266 Phi. 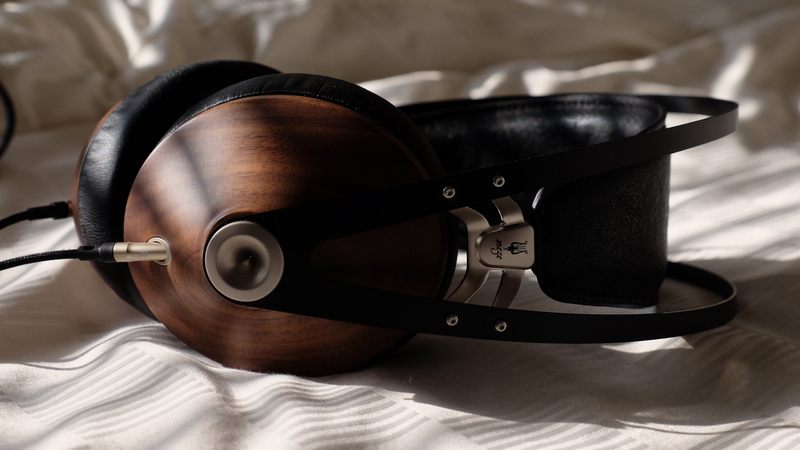 There’s a reason why you’ll see so many experienced reviewers with an Abyss headphone in their listening room – this headphone sets the bar for many discerning ears. 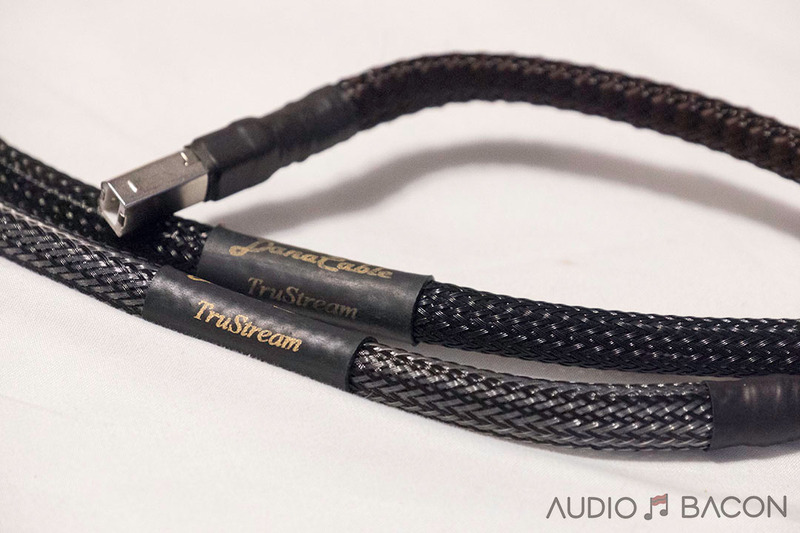 It’s simply a spectacular technical and musical achievement in the headphone space. Its resolving and tactile capabilities make listening more of an immersive, out-of-your-head, experience. In fact, the Abyss was my motivation for exploring high-end headphones. There’s now a newer and better sobunding revision called the Abyss Phi CC. Evolution is great but one thing remains true – the Abyss Phi requires ample amounts of power to maximize performance. You won’t get nearly the layering, imaging, or separation capabilities with a lesser amplifier. 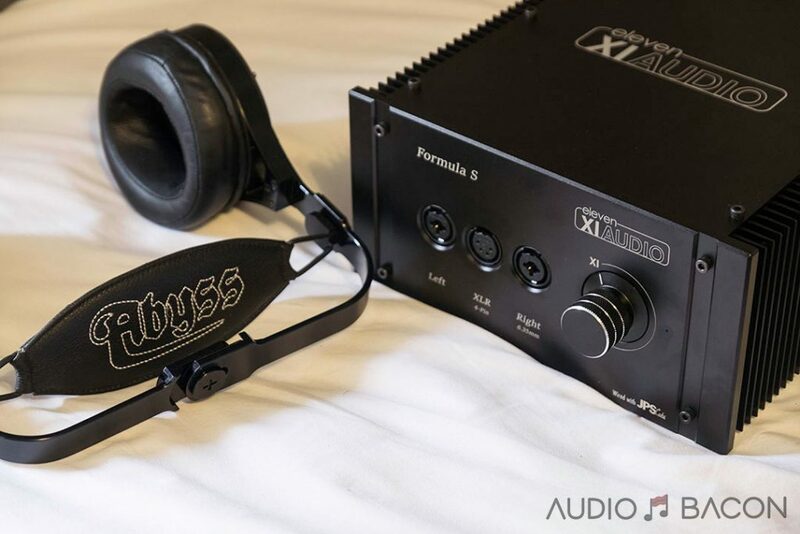 Some have even resorted to using speaker amps to drive their Abyss headphones. The aforementioned amplifiers were able to effortlessly drive them very well…but it came at a cost. A cost prohibitive to most. Mere mortals will probably want to spend more money on their headphones than their amplifiers. Luckily, there’s hope. 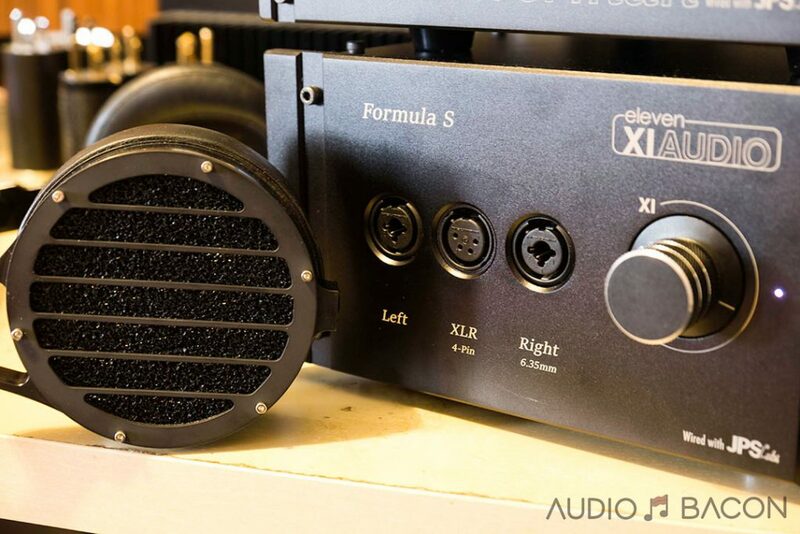 The Eleven XI Audio Formula S amplifier was not only designed to handle all demanding headphones, it’s also the amplifier used to voice the Abyss Phi! If there’s a way to hear what the designer intended, it doesn’t get much closer than this. 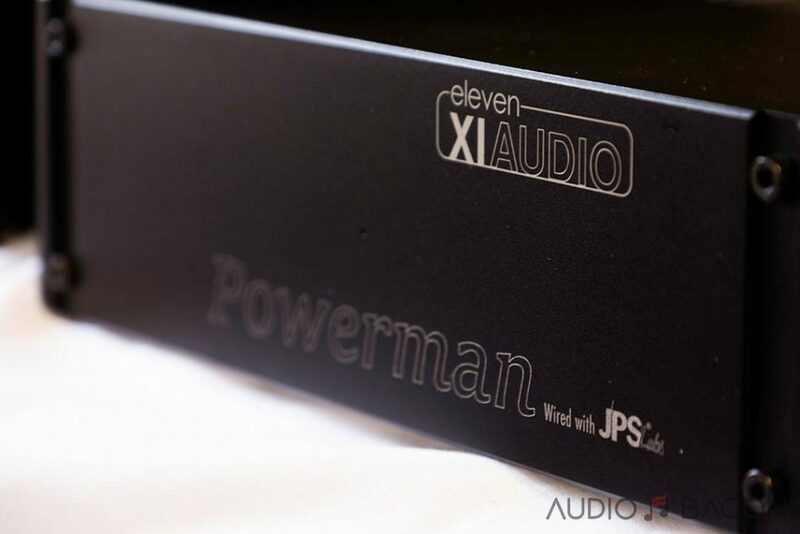 Given the partnership between JPS Labs and Eleven XI Audio, the Formula S is wired with JPS Labs Alumiloy. The best part? It’s only $3,499. 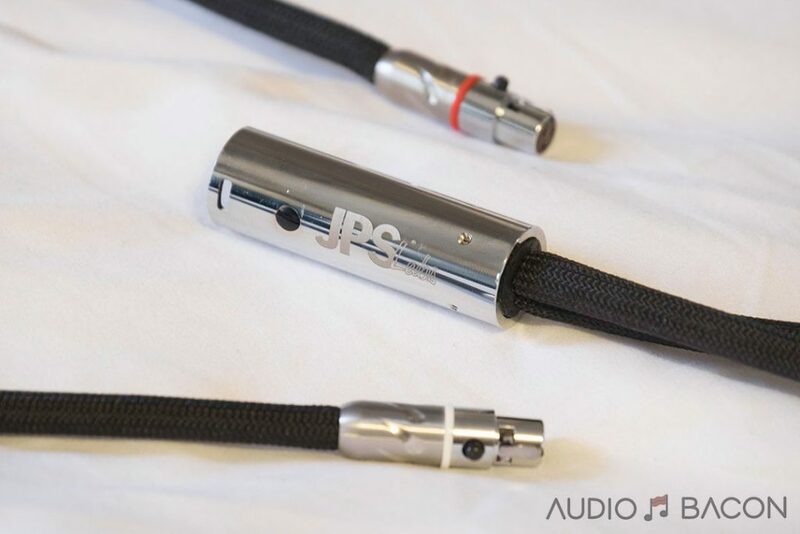 The PowerMan is also wired by JPS Labs. By now we know the benefits of having a better power supply. In almost all cases, it’ll elevate your equipment to surprising heights. 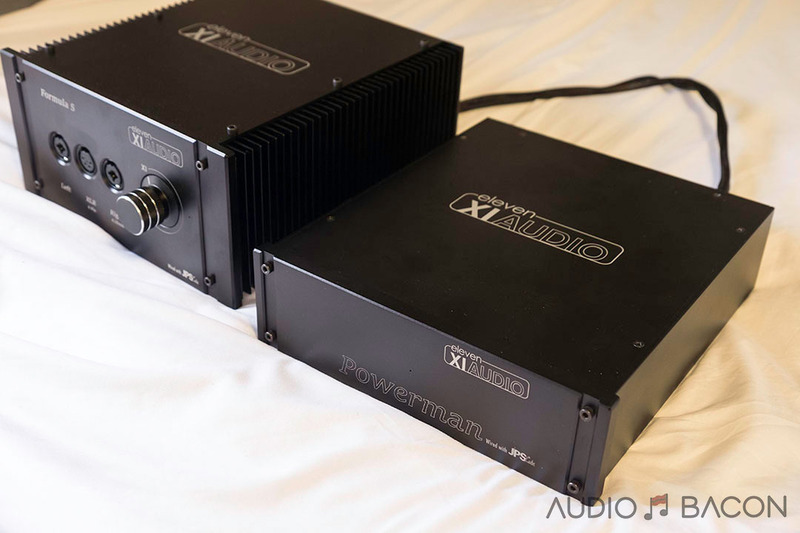 Eleven XI Audio understood this and developed the PowerMan power supply to pair with the Formula S. As could you see from the photos, they look stunning when paired together. 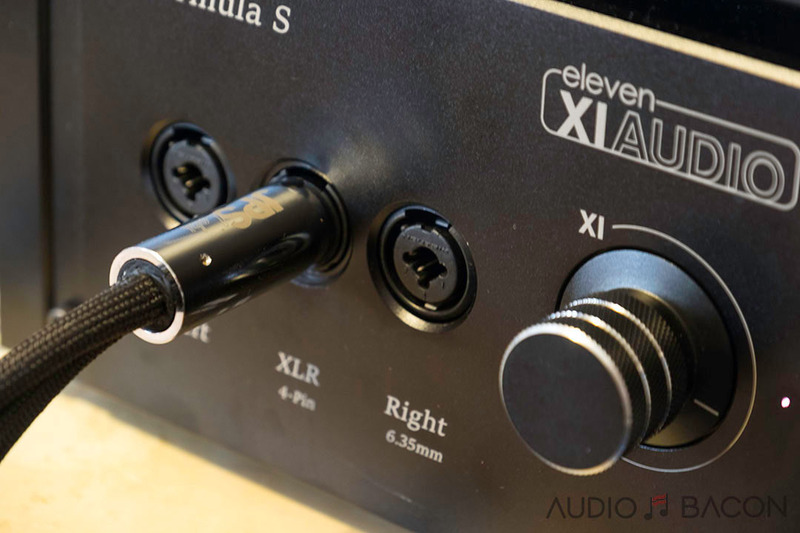 Eleven XI Audio TM shows the headphone world the true sound of music. 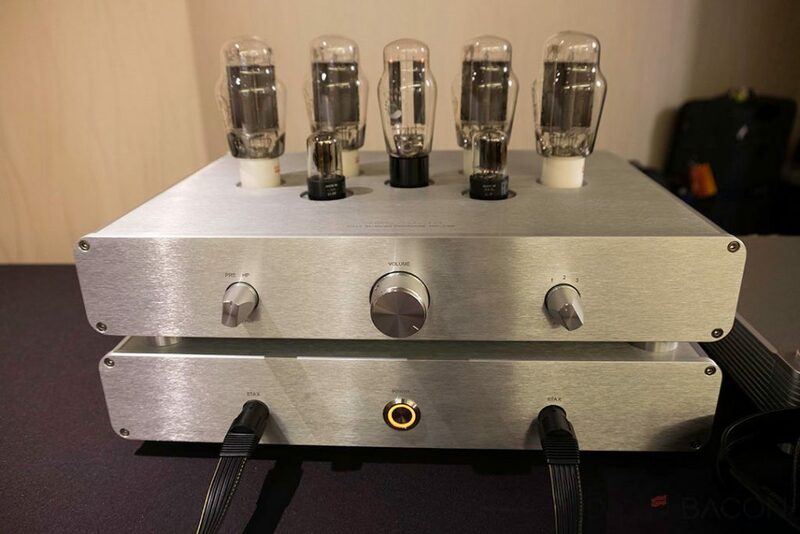 Solid state dual mono amplifiers deliver stunning speed and clarity, with hard hitting bass and drums and beautifully smooth tube-like decay to cymbals and string instruments, on up beyond perception, the Formula S amp is tuned for the highest resolution music and headphones. Impeccable balance, smooth and clear to the source, excellent bass definition, simply put the dedicated headphone amp every conneseur seeks. And it’s stout size takes up less real estate on your desktop. 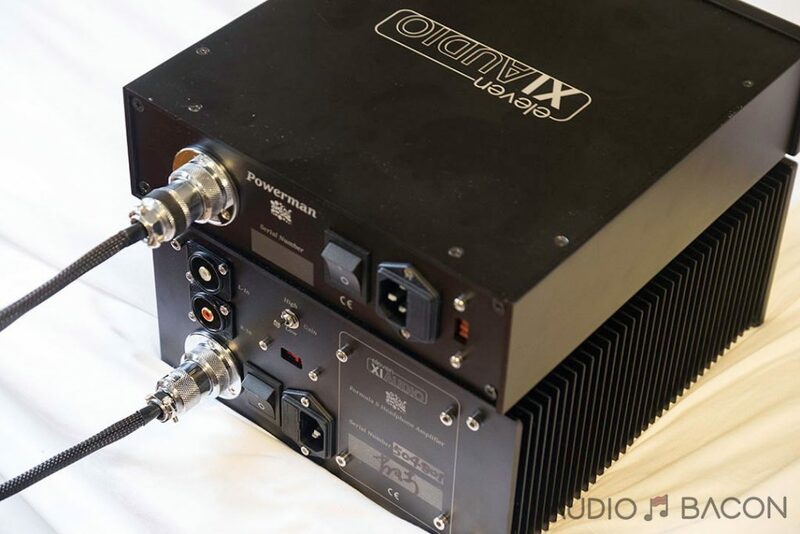 Upgrade the already excellent sound of your Formula S headphone amplifier with this external high current power supply. Designed to sit below and mate with the Formula S, the Powerman easily connects with the supplied umbilical cable to replaces the internal power source. 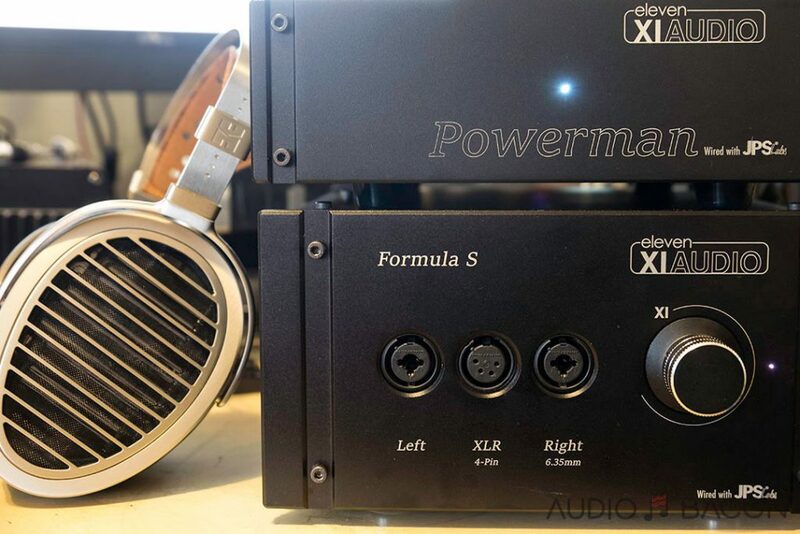 From the aluminum chassis to the quality connectors, the build quality of both the amplifier and power supply is one of the best I’ve ever seen from a headphone amplifier. The laser markings and purple LED are a nice touch. Aesthetically, much more refined in handsome black over the original silver models. A look that surely complements the Abyss Phi, but every headphone as well. The volume knob had a nice tactile grip and was fun to adjust. Output protection – turn-on/turn-off delay to keep your high-end headphone investment safe. Surprisingly, most high-end headphone amplifiers don’t have this feature. A single set of RCA inputs wired directly to the volume control with JPS Labs Alumiloy® wire (no switches or extra circuit paths) for ultimate transparency from source. 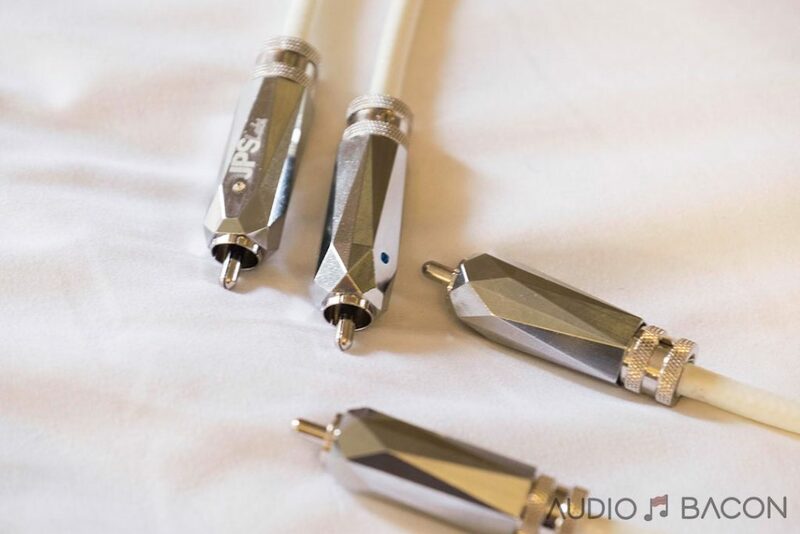 XLR inputs available upon request. High-gain is more open, more textured, and articulate. YMMV depending on headphone used. 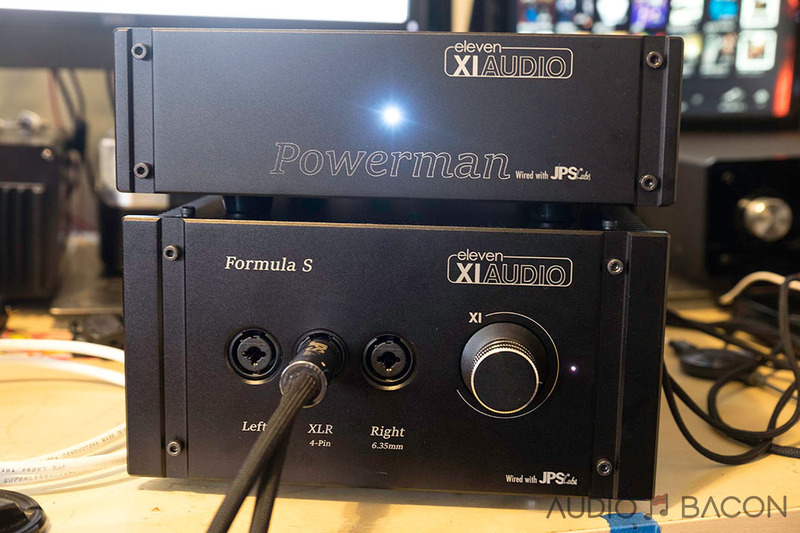 It’s recommended to keep the PowerMan below the Formula S amplifier. I placed the PowerMan below and above the Formula S and I didn’t hear a huge difference. YMMV. As far as power cords, I used the High Fidelity Cables CT-1 Ultimate. DAC was the Chord DAVE, the source was the Innuos Zenith SE music server. Assuming resources permit, if you’re going to purchase the Formula S – you should pair it with the PowerMan power supply. Although the Formula S already sounds great on its own, the sonic differences are considerable. Obviously, you’ll only be using one power cord on the PowerMan in this arrangement. 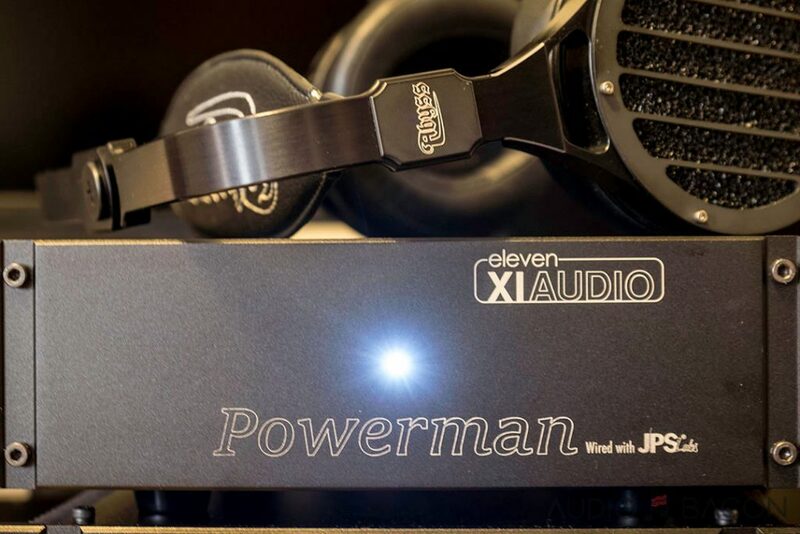 If you’re already enjoying the performance of your Eleven XI Audio Formula S amplifier – you’ll pull out your wallet once you hear what the PowerMan could do. A much lower noise floor. Dead quiet. More solidity and less fuzz/grain. Smoother. More weight and powerful dynamics. Improved layering and delineation capabilities. Truer tone and timbre – both voices and instruments sound more natural. Also, the combined footprint when stacked is nice for a small desktop. Needless to say, I used the PowerMan power supply for the majority of my review. First, earpad adjustment is crucial when trying to get great sound from these headphones. The highs shouldn’t be sharp and the lows shouldn’t be flabby or lopsided. There should be an even distribution of bass across both earcups so swivel and bend accordingly. The Abyss Phi is all more about transparency and accuracy. To my ears, the Phi bettered the original in every category. It’s much smoother (especially on the top end), has refined articulation, is spectrally balanced, and overall more solid. 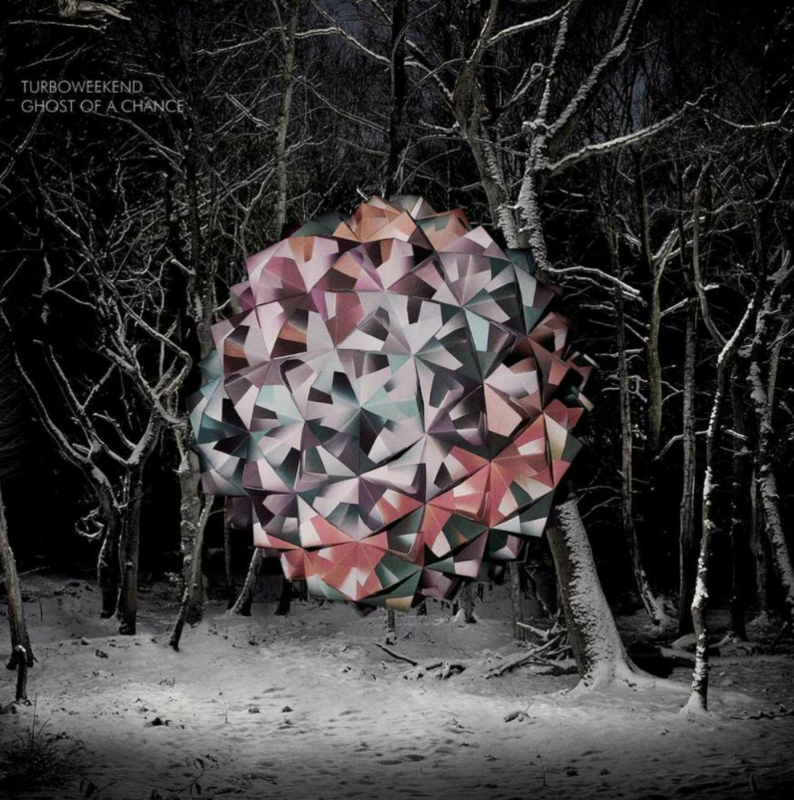 Subterranean-bass still sounds like you have a pair of subwoofers attached to your ears, but this time more nuanced and textured. Soundstage is realistically sized with the right amount of reverb and air. I still haven’t heard a headphone that combines this amount of tactility and transparency, period. No aural nuances are left unturned in Spinning Wheel by Blood, Sweat, & Tears. The tonal contrast of the piano to the brass and drumstick snaps are utterly mesmerizing. The focused voice is never perturbed by the rhymic rumbles or razor fast transients. There’s plenty of textures, dynamic excitement, and precision – overlayed over a pitch black canvas. I don’t recollect hearing this level of micro-details from this recording. From air leaving the brass to the extra bit of enunciation from the voices – these are the lifelike qualities that add to the enjoyment of music. The Formula S effortlessly digs deep into the spectrum and extends far in both directions. The Formula S drove the HEKV2s with ease and finesse. The higher gain option on the Formula S provided a denser tone and a more resolving low-end – so I kept it in this setting. 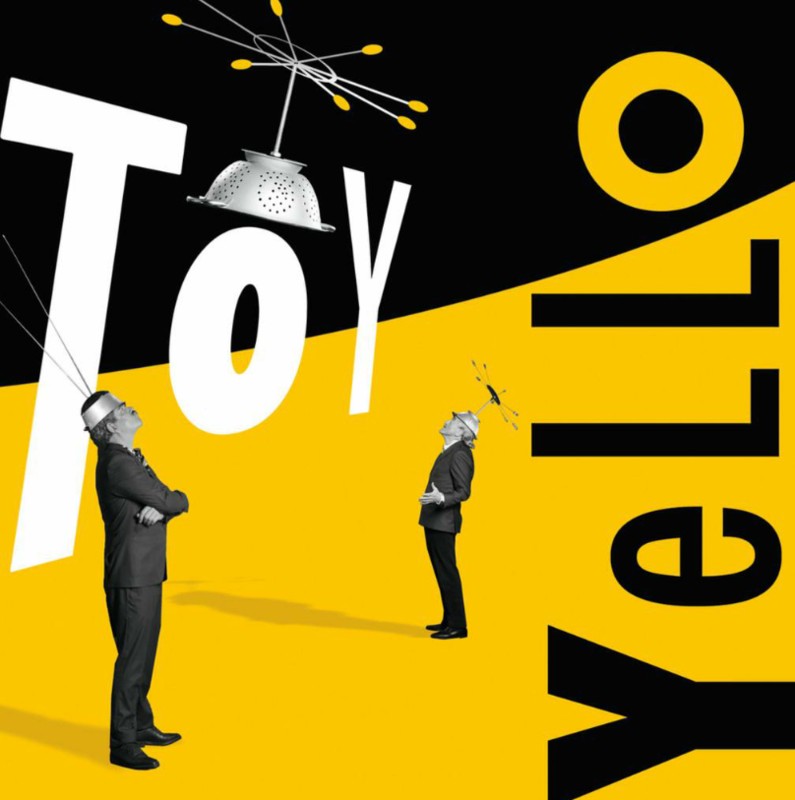 In the intro of Kiss the Cloud by Yello, the HEKV2s goes low without losing elasticity or composure. The seductive vocals are beautifully painted with bottomless grit and infinite air. 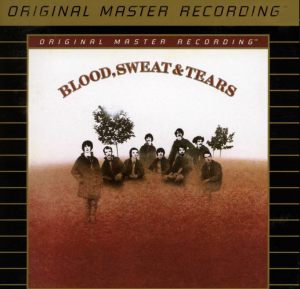 It stays coherent with the synthesized pieces that are revolving around the recording. The Formula S did a wonderful job of presenting natural depth and an eerie sense of acoustic space in this recording. The Formula S is super quiet. This brings an enormous amount of resolution and micro-details to the forefront, which complements the thicker nature of the Aeon Flow. In Sweet Jezebel by Turboweekend, the bass is never overwhelming and the aural nuances floating in the rear are fully realized. The layering and dynamic capabilities of this amplifier are in full effect. 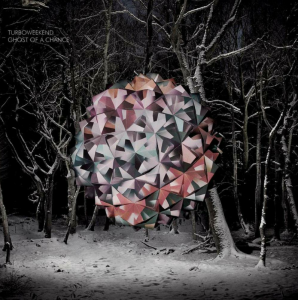 Providing a calm, precise, yet engaging sonic perspective that’s difficult to not be immersed in. An intense soundstage and a most hypnotic presentation. The Eleven XI Audio Formula S meets a nice middle ground as far as tone, resolution, and soundstage. It’s not too warm or too analytical. Law of the land: one can’t have it all. There are sacrifices made in clarity/dynamics versus the Headtrip and the fuller textures and richer tone versus the WA33 – but it has enough of the important pieces to be addictively musical. It’s exceedingly smooth and very balanced in its sound. That said, it sounds superb with the character of the Abyss Phi along with the other headphones I had on hand. These are all top-of-the-line amplifiers. You’re not going to get a bad sound out of any of them. As always, which amplifier you decide on depends on your sensibilities – and your bankroll. It’s clear at this point that the DAVE could bring Abyss up to ear-splitting levels and offer an insane amount of transparency/resolution. But it simply doesn’t have the headroom to relay the layered atmospherics and explosive dynamics in a recording. Delineation of singers and instruments, focus, and the noise floor are much better presented with the Formula S + PowerMan combination. The performers sound like they’re performing in a three-dimensional space before you. 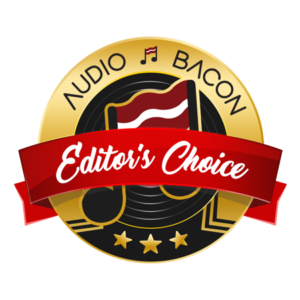 The DAVE’s output does have a warmer tone but the sonic landscape is noticeably flatter. To maximize your Abyss Phi, you’ll need an external amplifier. 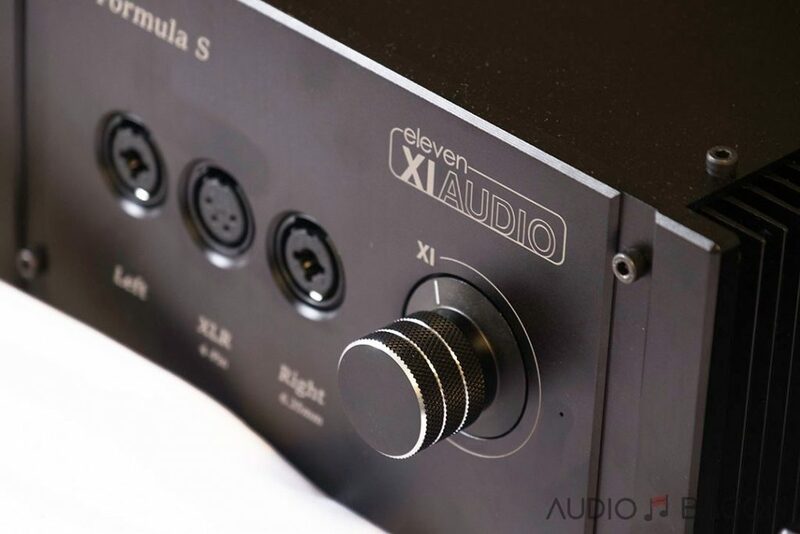 The fact that the Abyss Phi was tuned on the Eleven XI Audio Formula S headphone amplifier resulted in a beautiful and synergistic pairing. Together, they complement each other’s sonic traits. 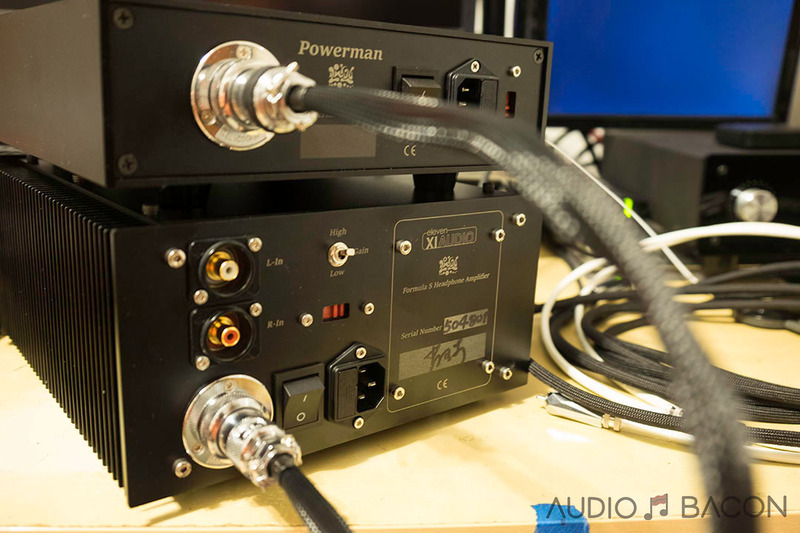 With the optional PowerMan power supply attached to the Formula S, the sound quality is improved – substantially. Although this combination isn’t inexpensive, it’s still priced below those of some of the competitors. 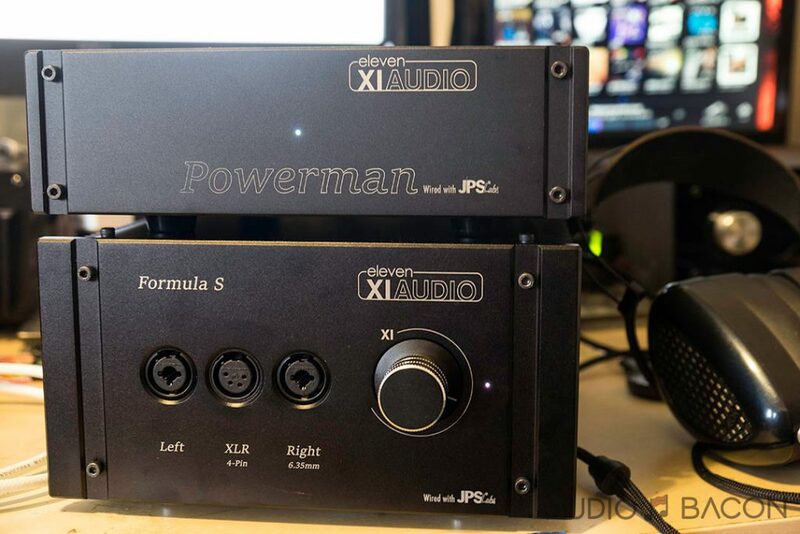 The Eleven XI Audio Formula S and PowerMan power supply should be on your short list of amplifiers to audition. Especially if you own an Abyss Phi and don’t want to break the bank. 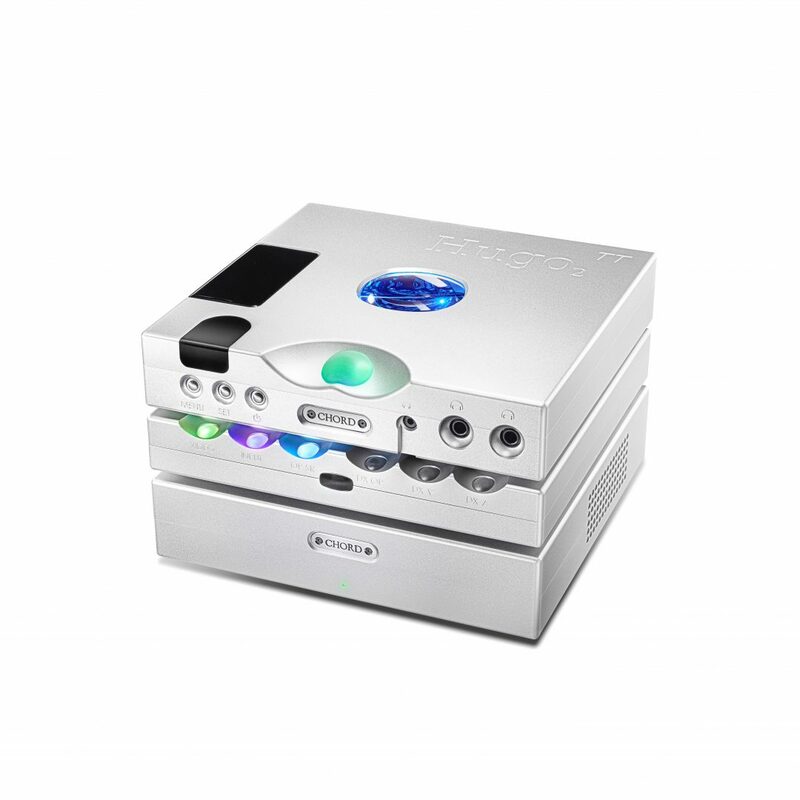 It has all the qualities of a high-performance headphone amplifier and will also serve the rest of your headphone collection very well. PreviousAbyss Phi CC – Now with Ceramic Coating and New Pads! Nice write-up. Nice looking pieces of gear. I’ll have to check into it sometime down the road because I love my Phi, it is my preferred phone of the 5 I own by a significant margin. Hi Jay, very nice review as usual! As an owner of the ZENith SE, DAVE and Abyss Phi, I am looking very closely to replicating your review set-up at home by adding the XIAudio bundle to my rig (WA33 or Headtrip Reference are both out of my budget). 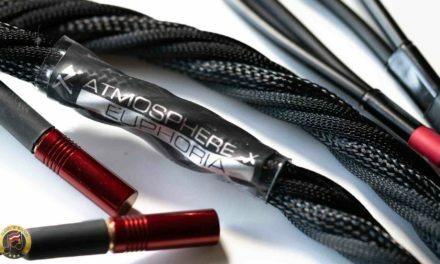 May I ask what headphone cable you liked more among the JPS, Dana and DHC when pairing the Abyss Phi with the Formula S / PowerMan + DAVE?